These supersoft knee high socks are made from 82% natural, organic cotton that's grown free from the use of pesticides, for a beautiful, rich feel against your skin. The high organic cotton content ensures your feet stay dry and fresh, wicking moisture and sweat away from the skin to keep your feet healthy all day long. 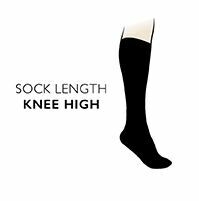 Designed with comfort in mind, these knee highs have hand linked toes for smooth seams and a Comfort Cuff ensuring they won’t cut into the leg. The plain design makes them the perfect accessory for a variety of outfits, while the cloud soft touch makes them a pleasure to wear.